Sometimes it’s easy to get so caught up in your day-to-day working lifestyle, that you lose sight of how remedial an enjoyable work function can be on productivity and morale among workmates. However, a corporate event can be tricky, and tensions can run high if you hit a bump and the function doesn’t go to plan! If you’re organising your upcoming work event, or thinking of suggesting one, take a moment to read through our tips on preparing for your next corporate event, so you can ensure all of your guests have a fantastic time, with a renewed enthusiasm and sense of team spirit. Whether you’re holding a team building event, a workplace get-together, or a training seminar, think about what your guests are hoping to get out of it, and take steps to ensure this occurs. For example, if you are running a meet-and-greet networking function, set aside plenty of time for guests to interact. If you are hosting a smaller workplace event such as a lunch, check that there aren’t any dietary restrictions you may need to be aware of. So you have the venue, and your guests turn up… Now what? If you haven’t appropriately organised caterers, audio and visual equipment, or any of the other suppliers you may need, then your event could be in dire straights. This could be from a coffee or glass of wine on entry, to a gift bag with complimentary pens and notepads. Some venues will offer package deals with caterers or suppliers, and some will operate alongside companies which restrict you from hiring other companies if you require use of that venue, so have a good idea of your venue and suppliers, and book simultaneously. Some workplaces may have a conference room or something similar to offer for workplace function use, but if you’re planning a larger event or a special function, you will need to look around for a venue to fit your taste and budget. Secure your corporate event venue as soon as possible, as many venues will be booked out months in advance, and consider factors such as location, amenities, parking, and any requirements your guests may have such as wheelchair access, before making a final call. When you have everything booked and ready to go, you need to get down to the details and think about your schedule. Starting with the overall arc of the day, draft out when to expect attendees, when to commence the session, when any breaks will occur or refreshments be served, and when the event will come to a close. Once you have this information, refine it further until you have a successful itinerary planned. As the day gets closer, confirm and reconfirm details with venues, caterers, suppliers, and guests. Often smaller aspects get overlooked or presumed, and that is how they get missed. This can be confirming registration details, or ensuring there are non-alcoholic beverages available, or suitable amenities. For your next upcoming corporate event, try something unique at the Chinese Garden of Remembrance, our stunning functions venue, available for hire. At Hannans North Tourist Mine, of Kalgoorlie, we have designed an oasis to compliment and contrast with the landscape. 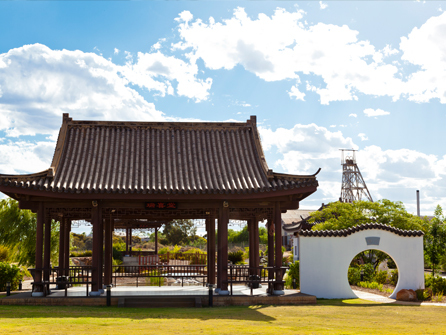 Surrounded by historic gold mines, staggeringly large enough to be visible from space and still conducting explosive blasts into the earth for valuable minerals and metals, the Chinese Garden of Remembrance -complete with traditional pavilions and water features- was a community project alongside the Simon Lee Foundation, and commemorates the contribution of overseas prospectors in the early West Australian goldfields. Aligning with basic principles of hope, harmony, balance, and beauty, the Chinese Garden of Remembrance creates the perfect atmosphere for your upcoming function to admire the resilience and prosperity of Australia’s heritage.